This is not something new, major email providers such as Gmail, Yahoo and Hotmail have been using this for quite a while now and it has proven to be successful to keep your accounts uncompromised and hacker-free. We have also created it for your owner account, as we felt that an email address and a password alone was not enough to keep the account safe. If two people need to access the same user account, then it is possible to add an extra mobile phone, which can also receive the sms to access. This can be set up in the 'My Details' section. 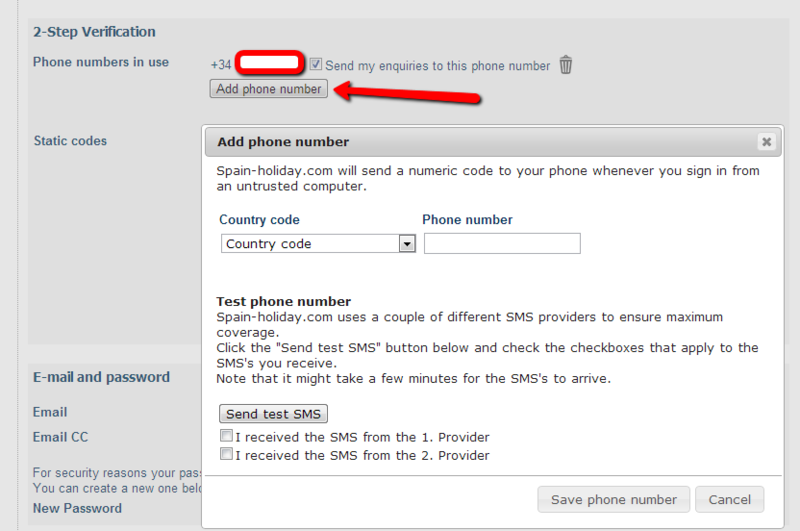 What happens in case I change my mobile phone number? Login to your account as usual from the same device, where your login details are still stored automatically. Go to "my details" and change the mobile phone number there. In case you have forgotten to do this and the automatic login no longer works, the only possible way to change the phone number is by contacting support. You will be asked some security questions so we can verify your identity and then we will set up the new phone number for you. Feel free to contact support if you have doubts or questions.